Wednesday evenings at HRBC are a time to pause during the week in order to gather for fellowship, laughter, Bible study and encouragement. 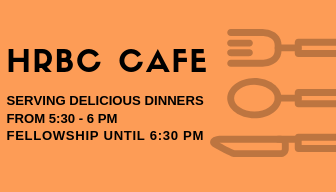 The evening begins at 5:30 pm with the HRBC Cafe, children are dismissed at 6:00 pm for their activities, and youth and adults meet in a variety of studies at 6:15 pm. There is something for every age, no matter your place in the journey of faith! See details for each group below. Oftentimes we put doing ahead of listening to where God is already at work. In our 2019 lecture series, learn how being present to God in the people and places around us is the first step in changing the world. The series will feature dynamic speakers on Wednesday, January 9, 16, 23, and 30 from 6:15 – 7:15 pm in MPR 2. This women’s study tackles topics that are close to a woman’s heart as a follower of Jesus. Join women as they support, encourage and pray for one another as they seek to follow in Jesus’ path. This group is led by a team of leaders and meets in room 125. This women’s small group is finalizing its fall study of Beth Moore’s in depth look at Second Timothy. If you are looking to join a group, don’t let this discourage you as they will being a new focus early into the quarter. This group is led by Tanja Cottrell and meets in room 122/123. Building off the Winter Lecture Series, Practices for the Church on Mission, this group will consider more deeply the practice of reconciliation that God initiated in Jesus and that Jesus’ followers are called to emulate in all their relationships. What does it look like for the church of Christ to confess its mistakes and seek forgiveness? What does it take to forgive a person or institution that hurts you? What does genuine reconciliation look like and why is it necessary for the church to lead in this area? Join the conversation during this eight week study led by Matthew Hensley. The group will meet in room 104. The book of Revelation has always intrigued believers as mysterious book about the future and how God will finally prevail. While there is much to learn about God’s future promise in Revelation, there is much more to understand for living a faithful, committed life as a Christ follower today. Join this group as they take a deep-dive into the words and witness of Revelation. Led by David Cottrell in room 102. This study invites men to imagine taking routes untraveled as they follow the story of Lewis and Clark’s quest to find a water route to the Pacific Ocean. How is God calling followers to faithfully follow the Spirit into uncharted territory for the gospel and the sake of the world? Those interested in leading people and organizations in new directions will enjoy this study led by Pastor Bob Lee. The group will meet in room 116/117. This ensemble leads in worship five to eight times per year and participates in seasonal programs and presents a musical in May. 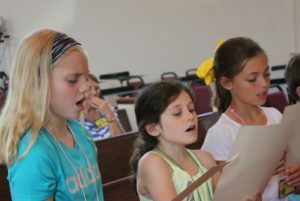 In this choir we learn about musical concepts and theory, meaning of sung texts, and worship leadership. Our rehearsal is an action-packed 45 minutes of music and fun! Rehearsal starts at 6:45 pm. This is ensemble is designed more for the experience of learning about God through music, rather than presentation of music in worship or concert venue. These are our little ones who sing “sitting” on the floor usually with a guitar accompaniment. “Rehearsal” is from 6:00 – 7:30 pm. Small groups take the teaching of large group and helps students process it at a more personal level. These groups are divided by age and gender. It is a time where students can pray for each other and learn how to be accountable to each other. This is a place of deeper growth for the students. It takes place during the school year. They meet at 6:15 pm. Children learn how the love of God is being expressed locally and around the world through our partner missions. Children also plan and carry our their own mission experiences. They meet at 6:00 pm. Brunswick stew, smokey brisket, grilled vegetables, sweet potato puree, bread & for dessert bread pudding with a caramel sauce and fresh cream. Reservations are due by Monday, April 22 at noon. Make a reservation by clicking the link below or calling the church office.